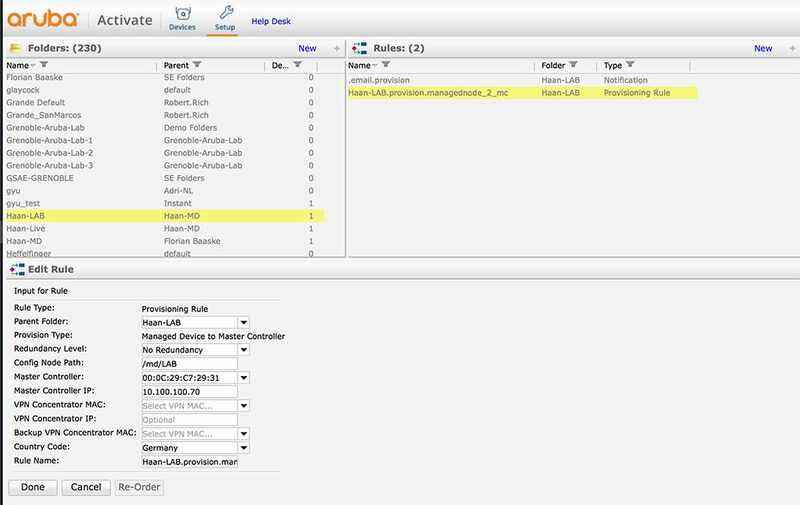 In this post, I describe the different ways to deploy a controller with ArubaOS 8. Controller Deployment is significantly easier with ArubaOS 8 and it is the first time, that we see Zero Touch Provisioning for controllers. With ArubaOS 6.x it was not possible to have a complete Zero Touch Provisioning process. The fact, that you have to configure stuff like the IP of the local controller, made this impossible. 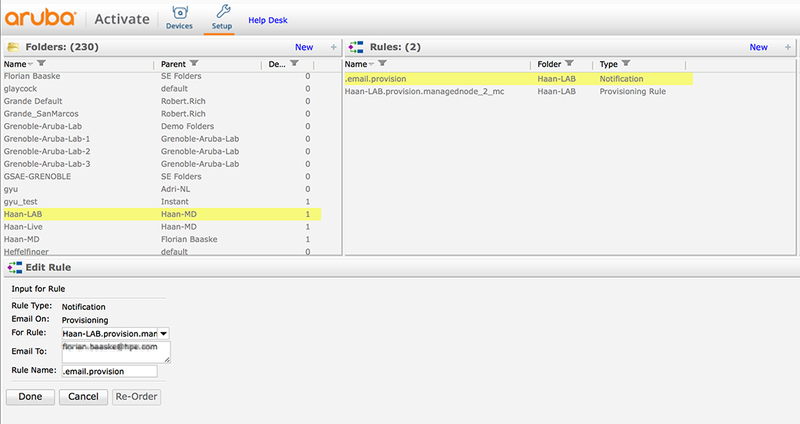 With ArubaOS 8 you configure everything on the Mobility Master (MM). There is no need to configure something on the controller. You even have no chance to. The configuration mode is blocked. Nevertheless, you have the option to deploy the controller the old way. This is the first part of this post. Afterwards, I show you how the Zero Touch Provisioning works. The first part is about the manual deployment of controllers. This is still possible and much faster than with 6.x. I assume, that you have the MM up and running and IP connectivity is possible between the Managed Device (MD) and the MM. I always create the PSK at the “mm” level. If you have multiple MM controller, this makes the configuration on all of them. The “local-peer-mac” is the MAC of the MD. If the MD is a hardware controller you need to use the MAC from the VLAN interface, which is used to connect to the MM. If the MD is a virtual controller, you need to use the MAC from the management interface. Default-node is not configured. Autopark is disabled. I create the new device with the first command. The second one is to check. The new device has no “Name”. After the device connects to the MM, this field is populated as well with the hostname of the MD. Now, it is time to start the MD. The scenario above is for one MM without a VPN concentrator. I will build this in a later post. The scenario is also only for the “PSKwithIP” option. If you choose the MAC for authentication you need to change this to “PSKwithMAC”. The most important pieces of information are the IP of the MD, the IP of the MM and the shared secret. You can change the rest afterward on the MM anyway. But those are important to initially connect to the MM. To use a PSK for authentication is not the best way. 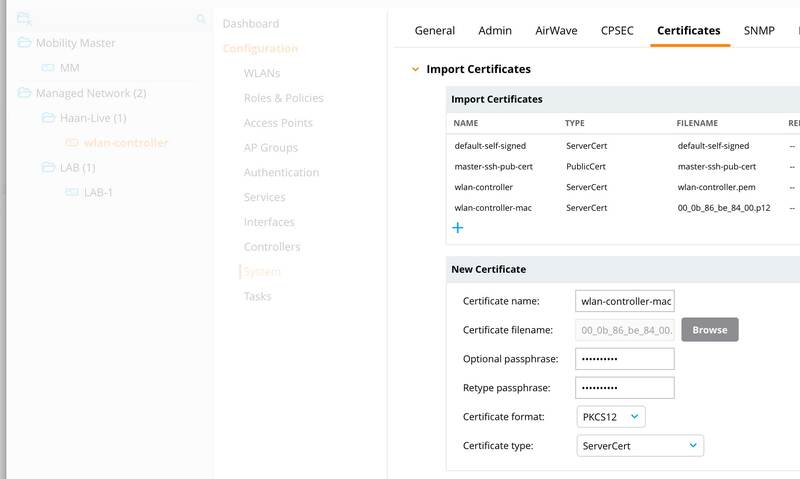 So, to improve the situation, you can use a certificate for the IPSec connection. 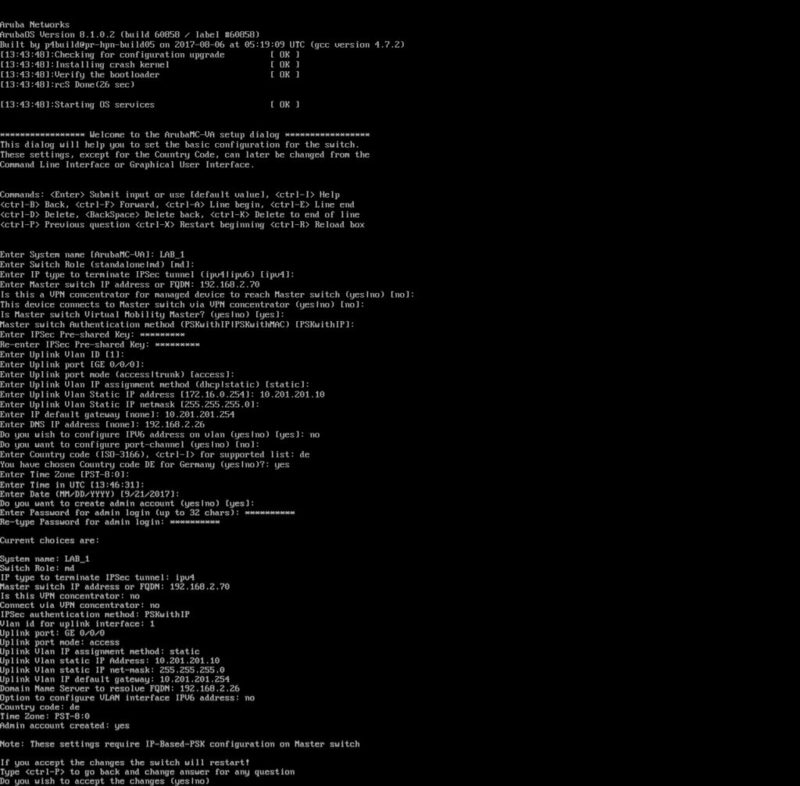 With the CLI wizard, it is not possible to use a certificate for IPSec during the initial configuration tasks. But, you can change this afterward. Choose either “PSKwithIP” or “PSKwithMAC” from above and wait until the controller is fully connected to the MM. To make this work, you have to create certificates for the MM and all MD’s. In my lab, I use the CA from ClearPass. You can use whatever you like to create the certificates, but keep one thing in mind. The subject of the certificate has to include the MAC of the controller. The MAC, you use, in the commands to configure the MD<–>MM connection later on. You need 2 certificates for every controller. The root CA certificate and a client certificate. The root CA certificate is the same for all controllers. The client certificate is unique and has the controller MAC address in the subject. Select a unique “Certificate Name” and select the certificate from your computer. The certificate includes a private key. A passphrase protects this key. You specify the passphrase during export or creation of the certificate. Enter the passphrase as well. Without the passphrase, the controller is not able to get the private key and cannot use the certificate. Select the “Certificate format” and the “Certificate type”. The client certificate is always a “ServerCert” and the root CA certificate is always “TrustedCA”. Click the submit button to upload the certificate. Do this for all MD’s and the MM. The controller will reboot and use the custom certificate for the connection. You cannot see the name of the certificate but from the “Initiator Phase1 ID” and the “Responder Phase1 ID” you can get the subjects for both certificates. And those match my certificates. To deploy controllers without touching them, you use Activate. Activate is a cloud-based tool to provision devices. I assume that you are somehow familiar with Activate. The first step is to add the MD to Activate. This step is an automatic process. Aruba adds any device to your Activate account which is ordered from you. After the device is in Activate, move it to the “Folder” of choice. All devices in this “Folder” get the same provisioning rule. Select the “Folder” with the MD as the “Parent Folder”. The “Provisioning Type” is “Managed Device to Master Controller”. I do not have any redundancy. But here you can select the type of your redundancy, with “Redundancy Level”. Put the node path into the “Config Node Path” field. This is the hierarchy level on the MM, where the device will be placed. Now, you select the MM mac address from the list of “Master Controller”. This assumes the MM is in Activate as well. You cannot use the ZTP with Activate if you did not add the MM to Activate as well. Also, specify the IP of the MM in “Master Controller IP”. You can also change the “Rule Name” if you need. You simply select the provisioning rule, which triggers the mail notification. That is everything. Without ever touching the MD it is up and running on the MM. Did you use the ZTP function of ArubaOS 8? Or any other ZTP functions of the other products. Tell me what you love about this feature and what you would change to make it even better.